I should make this an entire series of blogs, blogs about the "Weird Things That Intrigue Me," starting with this one, a blog about weird innovative fashion. I've blogged about my friend, Marco, who owns Cafe Grazie (click here) and his extensive collection of mannequins (mostly female) that have been decorated in the most eclectic and outrageous fashion. So outrageous in fact that I don't know any women who would dress like how he has his mannequins done up. 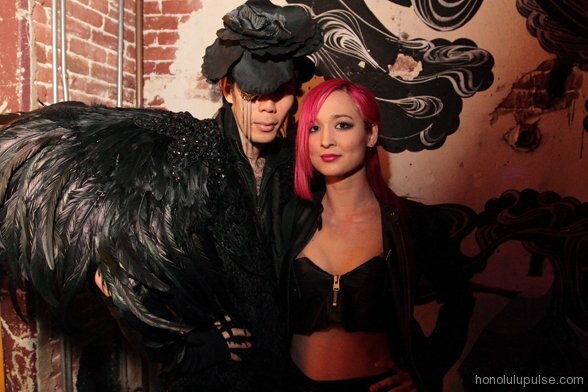 Fast forward to a few weeks ago, I attended an art showing where a very tall fella was dressed in all black, with wings, and the highest platform/leather/strapped/gnartothegnargnarsquared shoes, that I have ever seen (see attached photo stolen from The Pulse). The other weekend, I attended a birthday party at a homie's house and a gentlemen who clearly wasn't into buying Volcom t-shirts from Costco, Quiksilver shorts from a sample sale, or Hawaiianeken shirts from Town and Country, wore a fitted red tshirt, tucked into a pair of short gray shorts, and adorned with a pair of suspenders. Of course the entire story could not be told without describing the audience that surrounded these individuals. I will call them the majority, who made side comments, sneers, pointed, and chuckled. I was intrigued by their fashion, partly because of their creativity. But, this truly isn't a story about creative fashion, now is it? This is a story about individuals who I envy in their bold and honest expressionism. Now let's flip the script a little bit. I showed up to a hike with a pair of Prana capri pants (,that's very conservative compared to my heroes, the aforementioned individuals) and I received comments such as, "Don't only women wear capris"? "I know you do yoga but, it's only cool to wear Prana if you rock climb." I know these individuals were joking, but is there some truth behind their comments? Close-mindedness? Insecurities? Limits? Hiding among the majority? The reason why I pose these questions is because I once commonly made comments such as these, and the reasons why I snickered, I jeered, I pointed, and made fun of the "anomolies" was because I was close-minded, insecure, and had more limits, than I do today. I confess, I won't be showing up at work wearing black wings; or surf, wearing shorts with a 7" inseam; or don a skirt made of uncooked spaghetti but nevertheless, I think it's very cool. And to end, it's pretty scary to think I've evolved from hiding amongst the majority, to finding the coolness in the very things and people I didn't before. Gadzooks, what will I think is cool, tomorrow?